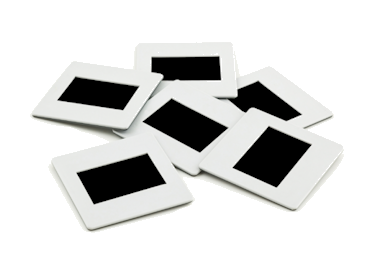 An item from the past … photo slides, a very popular method of sharing images taken. Using slide film one took them to a processor and they were made into square negative images that were then viewed in a slide projector on a screen, large size so everyone could view them. There were even smaller individual slide viewers which were used. Now, you might have boxes of these family slides and maybe no slide projector available. What do you do?? First, you do need to view each one, there just might be a ‘treasure’ there. It can be a very tedious job, but get some friends or family members together and make it a party. If you can’t locate a slide projector, do check with any photographers or photo processing companies. You can use the hand-held individual viewers also. Sort out the ones you find very interesting from those totally uninteresting. For example, 10 views of Niagara Falls (no family member in the shots), just the falls, might not be that interesting. Yet, the ones with family members or family homes, business shops, vehicles are not replaceable — keep those. Those not worth saving, there are numerous arts-craft projects demonstrated online that make use of old slides. You would be recycling / re-purposing them. Make a lamp shade, or window shade with them for example. How about a neat chandelier? Let your imagines go wild and have fun with the unsaved family slides. Next label those slides you are keeping. Place approximate year, the people and the places in the slide. You can write on the cardboard holding each slide. Once sorted and labeled, each slide needs to be scanned and made digital. 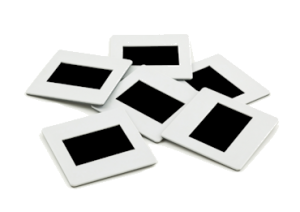 If you have hundreds of slides to do, there are available for purchase scanners that do slides and makes them digital to be saved on a flash drive, a disc, external drive and to your computer. There are also local photo companies in your town that can scan those slides including Wal-mart. Or check online to see what photo companies across the country do that service. There might be some you want a print of, so make that group separate to take to a print shop to have a nice large size print made. Yes, sorting and working with slides can be very time consuming, but do try to share the work load and everyone benefits. 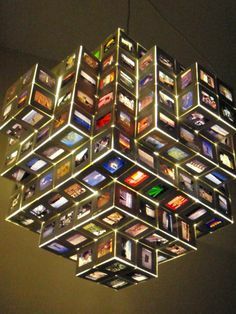 Photos: Collection of Slides; Projector and Labeling Slides; and Photo Slides Chandelier.